@webb.mcgrath: Hi Casey! When would you predict we can start colonizing other planets? And is it even possible? We are in a relatively new era where few things are impossible from a technological standpoint. We could start colonizing Mars within a decade, theoretically. Now, politically and $$$-wise, that may be the impossible part. Colonization starts with initial landings and scientific exploration. That has to be the initial focus, then stepping up to a sustained, Antarctica-like presence, then permanent presence. @broughton.fowle: A decade?! Wow. I figured you'd say 50 years. Note my hedge! If we had a true Apollo-like national/international commitment, we could start within 10 years. Getting that commitment is the hard part. @spendingtaxpayercash: Casey, what's the ballpark budget needed for an Apollo-like commitment? Well, project Apollo was about $120B in today's money, spent over 8 years. NASA peaked at 4% of total fed budget, and about 20% of discretionary spending in '65 and '66. But that's not sustainable. @wereotter: Not that anyone cares what I think, but I think we could use another Apollo-like program, something inspirational, and aspirational to give Americans something to rally behind, to encourage education for a generation, and to accomplish something positive. @hiscock826: Can The Martian really happen? 邏 The Martian can absolutely happen from a general technological standpoint. If you note details closely (like I do) you get the impression that The Martian assumes an Apollo-ish massive commitment of resources. That’s the hard part. @iraqi.tobaccy: Since the Martian was written, curiosity has discovered a ton of water on Mars. Does this discovery significantly change the economics of a Martian-like expedition? It does, but not in the way you think. Water areas are considered "special regions" and can only be accessed with hardware with extreme decontamination (don't want to seed Earth bacteria into Mars habitat). This adds significant $$$ to the cost of those missions. So discovering water actually means NASA can't directly investigate it with robots or humans at the risk of contaminating a habitable area. @cleland.seward: Do you think there should be strict environmental protection regulation for space travel/exploration? Or none at all? Environmental protection (of the env being explored) is taken very seriously by NASA. We actually have a UN treaty obligation that commits us to “Plantetary Protection,” I.e. Protecting other planets from Earth bacteria. @megan.brent: What affect is SpaceX having on NASA? As far as the missions they are pulling off and landing their spacecrafts? Important to note that NASA policy led to the success of SpaceX and other "new space" companies. NASA invested ~$500M in the Falcon 9 through the COTS (Commercial Orbital Transportation Services) program. SpaceX put up the other $500M. This is the essence of a successful public-private partnership. Movement for this began under GWB, kicked into high gear under Obama. Impacts are very big: NASA saves a lot of money not developing its own rocket. SpaceX is also shaking up the commercial launch industry, making the previous player, ULA, much more cost-conscious. Returned the U.S. To the world-wide commercial launch market, too. SpaceX is setting a high bar and moves quickly. Space is akin to telecom industry. High initial investment precludes a lot of normal market competition. Think of why we have only a few cell phone providers: need to build a nationwide network of cell towers. Rockets are similar: expensive to make, but also have the tendency to explode. NASA/Government can help build a new industry by providing investment and acting as an anchor customer to provide stability to new companies. @wholistic.thinker: When do you think we will see astroid and/or lunar mining operations? And at what point should commodity markets be concerned about that? There are several companies working on this right now (Planetary Resources, Deep Space Industries). Last year's SPACE Act helped provide some regulatory clarity to those efforts. However, it is my opinion that the tech is at least a good 15 years away, and it's very difficult to say if it will be financially viable. First step will likely be in-orbit refueling for satellites from ice deposits. However, the exciting thing is that there is real VC $$$ going into these companies. We're on the threshold, and these are serious companies with serious people working on this. @5oclocksomewhere: To what extent will space defense be leading space policy over space exploration? Defense-related space activities (at the DOD, NSA, NRO, etc) already get more funding than NASA. The Pentagon alone spends about $22B on space. NASA’s 2016 budget is $19.3B. @im.serious: We love spending money on defense. In a less than perfect world, what are some big tickets items you'd love for general space exploration that we could sell as defense related expenditures? Defense and civil space share a common contractor base that needs to maintain its skilled workforce. Space weather (think solar storms) is a good cross-cutting area, as is heavy-lift capability and in-orbit satellite servicing. @f-ck.sjl: How do we sell exploration politically? Demonstrating how NASA and exploration align with national priorities, is a very good start, and something that hasn't been used too much in the past. @broughton.fowle: Who's the most pro space exploration candidate? It's hard to say, since space tends to be at the bottom of the list for most candidates. I would have said Rubio based on his Florida connection and prev statements. Clinton and Trump both say nice things, as most people do. @spendingtaxpayercash: Where are we getting the most bang for our buck investments in space? I think the science missions at NASA have some of the highest ROI. They are orders of magnitude less expensive than human missions and are responsible for much of our knowledge of the universe we have today. Also, Aeronautics! @sam.ward: Let's boil it down. Why space? I'm fine with funding some level of scientific research, but there's a range of what should be supported, hard for me to see why NASA needs to be so special. I consider space to be a unique coalescence of tech investment, scientific benefit, cultural rejuvenation, and international soft-power engagement. Few areas provide so many ways to address national and international goals peacefully. @f-ck.sjl: How does NASA and exploration align with national priorities? I ask because as much as I think we should fund science for the sake of science that is simply not accepted anymore. To start: I think national needs for a 21st century workforce (high end manufacturing, engineering, science, etc) are uniquely stimulated by space. Also soft-power projection to developing nations and peaceful engagement of rivals. Apollo and the International Space Station are two programs that addressed national security needs—those opportunities are the most potent. I think NASA should think hard about how they can position themselves as a solution for next Admin. @morrow.fish: I'm an intern. 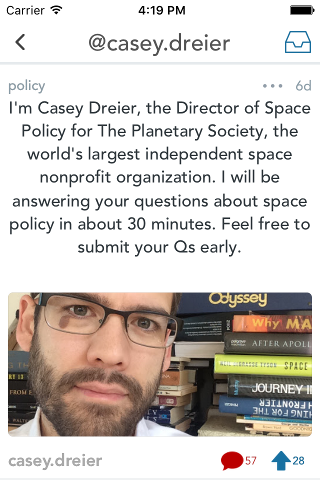 Who do I want to work for if I want to work on space policy? Look for anyone on the Space subcommittees of the Science Committee. Also relevant are members on the CJS appropriations subcommittee. @sonofsam.ward: Hi Casey! Many of us recently discovered that "astronaut ice cream" was a myth and was never actually eaten by those who broke the surly bonds of earth. What is NASA and the space industry at large going to have to do to restore trust in the public? Not only is astronaut ice cream not real, astronauts actually are growing lettuce in the space station. We’re through the looking glass here, people. @cleland.seward: Can you tell us some of the cool things you get to do personally at the Planetary Society? Maybe meeting cool celebrities etc. Well, my boss is Bill Nye, which never gets old. Neil Tyson is on our board. But honestly, the most cool part of my job is going to rocket launches, seeing space hardware, and talking to people about my love of space.